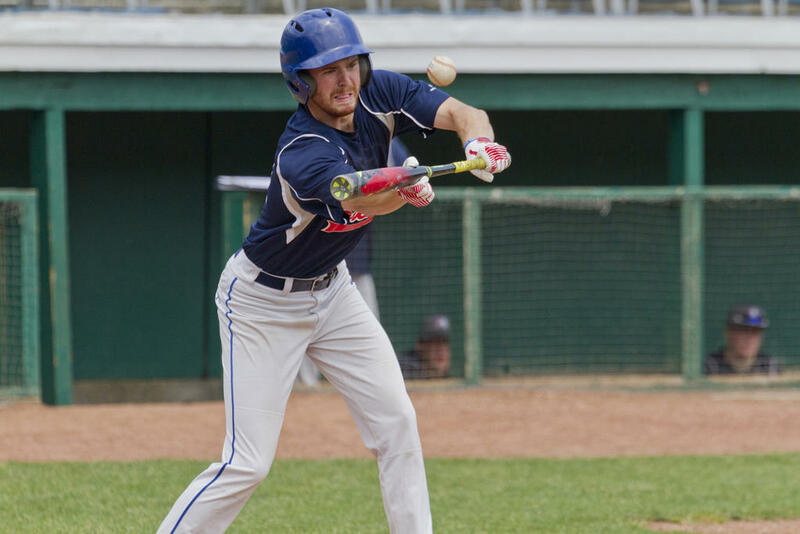 OLD ORCHARD BEACH—The Greater Northeast Collegiate Baseball League’s summer season is in full swing, and at the Ballpark on Sunday, July 1, the Patriots edged past the Nor’easters 4-3. The Patriots posted a big top of the first in their victory over the Nor’easters – well, as big a top of the first as one can expect out of a 4-3 result. The Pats hashed three in the game’s first ups, with Brody Dupuis (Hooksett, New Hampshire/Bridgton Academy/University of Maryland, Baltimore County) and Drew Abramson (South Portland, Maine/Bentley) both scoring on a deep Mike Kernan (Bedford, New Hampshire/Endicott) double to the leftfield wall. Kernan reached home on a Cam Cousins single. The Nor’easters battled back in the bottoms of the first, second and third. The team tallied one in each of those opportunities: Max Salevsky (Hollis, Maine/Bonny Eagle/Plymouth State) crossed the plate on a Ben Gravel (Rochester, New Hampshire/St. Joe’s) flyout to rightfield, for example, and Ben Malgeri (Stratham, New Hampshire/Holy Cross) crossed when Young grounded to first and Tommy Joyce (Portland/St. Joe’s), the Patriots’ baseman, opted for a fielder’s choice to second instead of one home. Kernan, however, put the Patriots ahead for good in the fifth. Kernan walked to reach, and scored four batters later, when Stephen Maybeck (Saunderstown, Rhode Island/Rhode Island College) singled into right. The GNCBL has added a new team this year, the Windjammers, and the League generally asks for (and receives) a fairly strong commitment from players to regularly make themselves available to play. Some leagues suffer when athletes’ other summer obligations (jobs and the like) preclude them from participating in every, or even most, of their squads’ outings. 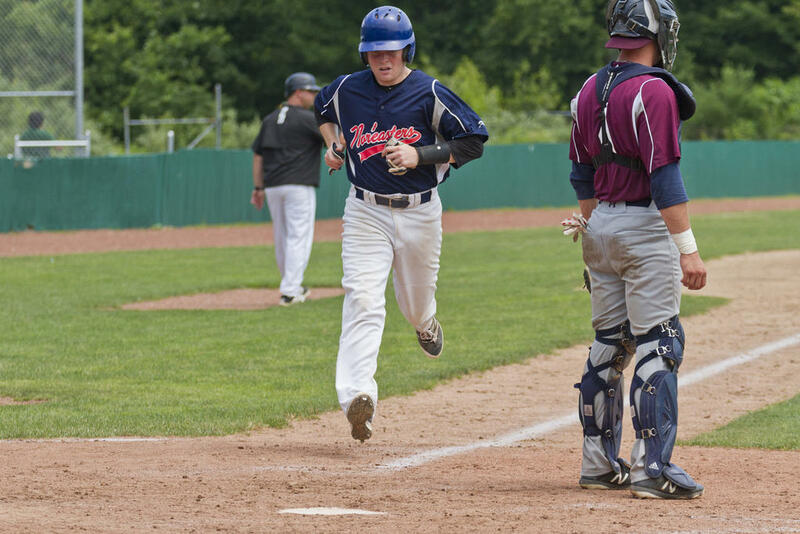 The GNCBL also holds contests at Wainwright Sports Complex in South Portland, at Southern Maine Community College in South Portland, at St. Joseph’s College in Standish, at the University of Southern Maine in Gorham. The League is online at www.gncbl.net; they’re on Facebook at https://www.facebook.com/gncblBaseball/ and Twitter at @GNCBLBaseball. Troy Bogdahn (Bonny Eagle/St. Joe’s) bunts for the Nor’easters in their narrow loss to the Patriots. Max Salevsky (Bonny Eagle/Plymouth State) arrives home for the Nor’easters, the first of their three runs in a losing effort vs. the Patriots.